Everything you’ve said about the knitting process remains a complete mystery to me, but I like your jumper a lot. Welcome to the owl club! Ha, knitting code, eh? 🙂 Thanks! Ohhh lovely! I’ve never tried cables – that should be next on my to-tackle list. I’m making an Andi Sutterland cardigan at the moment, but have just noticed that I’ve messed up a couple of rows down so it’s in my bad books at the moment! I hate that feeling – part of you wants to go back and make it perfect, but part of you is totally fine with it! Andi Sutterland’s designs are lovely. 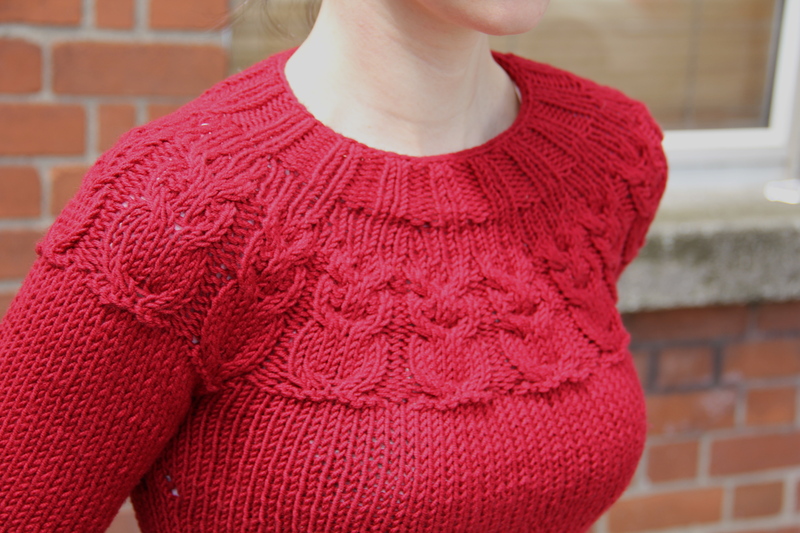 Owls is a great introduction to cables. The panelled jumper though has ‘fake’ cables – it’s actually clever increases and decreases that form the pattern. Love this! And love the owls 🙂 I have yet to commit myself to an entire knit sweater… I’ve have a few works in progress, but that’s about it. Beautiful job! The owls are adorable! I love cable and I love owls…if only I could knit! It looks amazing and a lovely colour. Thanks! 🙂 I think I’m drawn more to bright colours in the darker months of the year than during the summer, they really cheer me up on rainy days! This is loooovely. And the fits great!! I totally hear what your saying about being overwhelmed by all the projects you want to take part in. My head is spinning right now. I think i need time out!! Although I’m not a knitter so would probably end up baking or something!! Ooh, baking (and the eating of the baking!) is definitely a good time out activity. Looks amazing! Your ribbing & owls are so neat. I love the colour. 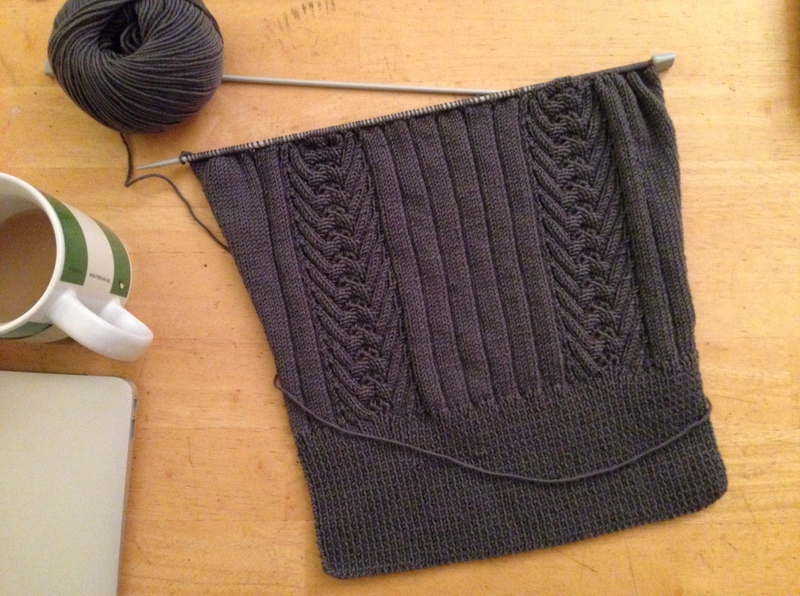 I’m looking forward to seeing your finished Lady’s Jumper – it’s looking great so far. Great jumper and lovely colour! 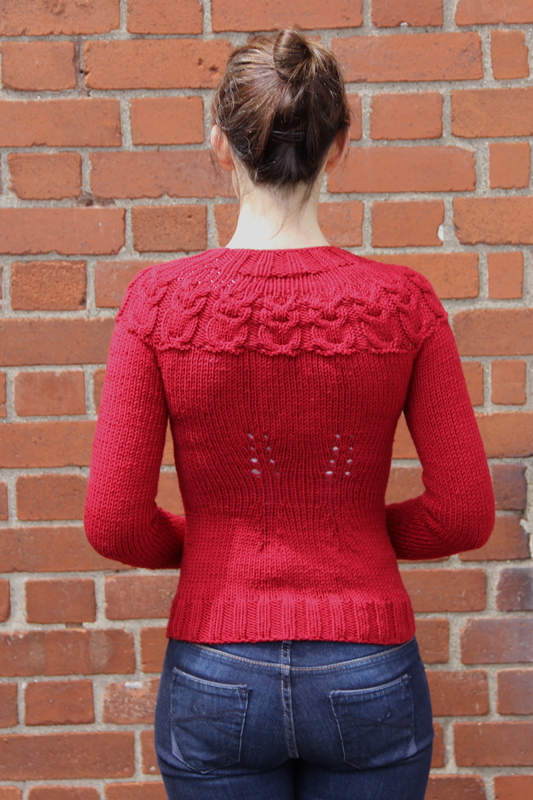 Owls was my first full, wearable, garment I knitted, years ago now, but it spurred me on to knit many more garments. I love the way Kate Davies writes her patterns very straight forward and clear. Not at all daunting like some can can be! I’ll look forward to seeing more of your finished garments! I’d love to try more of her patterns now after seeing this one through. She has so many lovely designs! There’s something really soothing about working on a longer term project. I think this is a good time to just take a bit of a sewing break and rejuvenate creatively though knitting! This is beautiful!!! I’ve tried to knit so many times but I just get tired of it so quickly.. the short sleeved sweater I started back in Feb is still going and we’re well into winter now! You did a fantastic job on the sweater. I’d never have guessed it was a first project. MMMay didn’t tire me out on sewing, but I’ll admit I have enjoyed wearing my RTW again. Still about a thousand projects on the go at home and nowhere near enough time to finish them all. Sigh. So beautiful! I love knitting and could knit all day but make myself sew too (it’s scarier than knitting haha). Beautiful colour and so flattering too. Well done! I definitely find knitting more intimidating but agree totally that it would be very nice to knit all day long! It’s so relaxing! Beautiful sweater! The fit is perfect on you. I’ve always been to scared to knit a jumper because of worrying about the fit too and it takes so long. Looks so good! I’m exactly the same. I aimed to knit a size bigger than my measurements because I tend to knit too tightly and the fit really worked out well. Gorgeous! Love the details on it. Thanks Ingrid! It’s a great pattern. Wow that is super amazing! Such a lovely colour on you and it looks gorgeous and snuggly on you – it seems to me that it will be perfect for an Irish / UK summer…. this warm spell is just a temporary state! Seasonally inappropriate or not this is a fantastic Jumper. I am so in awe and crazy jealous. My Mum has been trying to teach me to knit and I just can’t get it. Extra stitches just appear and then it gets so tight I can’t get it off the needle! One day maybe. But your make is brilliant. Oh wow I’m very impressed, this is so cute! And you’ve a fab figure by the way! Hi Sue, I have nominated you for the Versatile Blogger Award (although I wasn’t really sure if you may already have a nomination). I love reading about your makes and love your style! I love that owl jumper! What a great job! Thanks Rochelle! 🙂 Ah you’ll be knitting sweaters in no time! Your hats are fab – that’s one thing I really need to figure out how to do before winter sets in.